Your trusted Oklahoma City dentist, Dr. Joe Isaacson, is thrilled to welcome the passionate and enthusiastic Dr. Ashley Cook to the Oklahoma dental practice you trust. The team at Joe Isaacson Dental knows she’s an excellent fit; read on to learn more about the newest member of our professional crew! A native Oklahoman, Dr. Ashley graduated with honors from Southwestern Oklahoma State University located in Weatherford, Oklahoma. Shortly after, she received her doctorate in dental surgery from the Oklahoma University College of Dentistry. Dr. Ashley says her passion is simple: to help her patients. 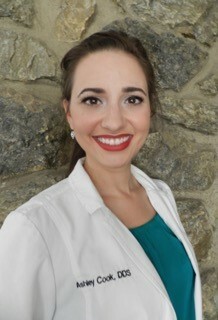 She’s been known to be a little too particular from time to time, but we think that’s a great thing — Dr. Ashley focuses on really getting to know each patient, understanding their individual needs and educating patients about proper oral care. She looks at is as giving them the tools for teeth that stay healthy for a lifetime. Dr. Ashley constantly seeks out the latest (and best) methods, techniques and information in the ever-changing dental industry. Dr. Ashley grew up in Altus, Oklahoma, a small southwestern town where she met her husband, Kevin. When Dr. Ashley is not creating beautiful smiles, she enjoys spending time with her family, relaxing, being in nature, jogging and doing arts and crafts. With the addition of Dr. Ashley, the team at Joe Isaacson Dental knows their trusted services will only be improved. With an array of dental services and extras, Joe Isaacson Dental is proud to be Oklahoma City’s one stop dental shop. We also offer the following bonuses for our patients. If you’re looking for a dentist in Oklahoma City, or if it’s been awhile since your last dental checkup, don’t hesitate to request your appointment today. Come in and meet Dr. Ashley and say hi to the whole team — we’d love to see you soon!